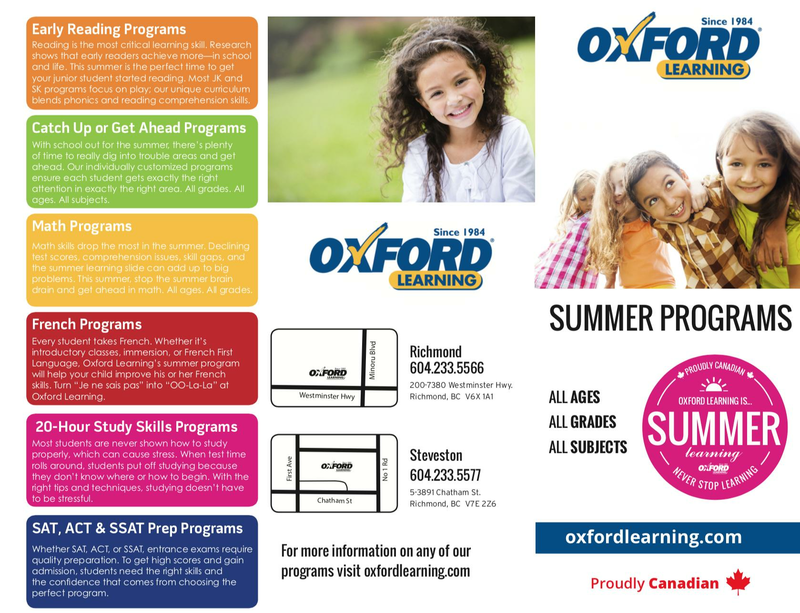 Check out our great summer programs and download our brochure! "To whom it may concern, Thank you for building Oxford Learning centre, because it helps me build confidence. When I am struggling, I will get a teacher to help me. The reason why I am writing to you is because my class listed companies that we loved and I chose Oxford Learning centre because it helps kids learn more academically. I come every Monday. I get to math, English, social studies, and sometimes science! Oxford Learning is not just about studying, it’s also very fun and joyful. This is why I chose to thank Oxford Learning centre." Oxford Learning Richmond is seeking a dynamic, enthusiastic and passionate full-time TEACHER/ TUTOR/ COORDINATOR. As Teacher/Coordinator, you would participate in all aspects in the centre. This includes office administration, managing all student programming and assessments, meetings with parents and school teachers, staff management and leadership, as well as working closely with students from age 3 to Grade 12. Your availability must be flexible. Please send us your cover letter and resume at your earliest convenience. Oxford Learning is conveniently located five minutes away from the Richmond-Brighouse Station. Oxford Learning is currently looking for an upbeat and dynamic teacher who wants to work in a rewarding teaching environment. Our programs offer individual support to students looking to improve their academic skills in Math and Science from Grades K-12. Our tutors can expect a steady income teaching the subjects they love! All instruction is done at our centre so there is no need to waste time traveling to each student's home. We provide all of the curriculum and rely on our teachers to interpret, explain, and guide our students to understanding and connecting with the material. University degree, BC teaching certificate is preferred. Experience with students from Grades K-12 in a teaching/tutoring environment. Superb written and oral communication skills in fluent, native English. Willingness to teach other subjects such as elementary English or French is an asset. Dynamic, energetic, and outgoing personality. During school year, must be available 3-5 evenings a week from 3:00pm to 7:00pm. Willingness to work Saturdays from 10:00am to 1:00pm is an asset. Immediate availability and flexible schedule an asset. Please respond to this ad with an attached cover letter and resume. No phone calls, please! Oxford Learning Richmond is currently looking for an upbeat and dynamic teacher who wants to work in a rewarding teaching environment. Our programs offer individual support to students looking to improve their French academic skills in reading, writing, and verbal communication. Candidates must possess a strong background in spoken and written French and must be comfortable teaching students in Grades K-12. Superb written and oral communication skills in fluent, native English and French. Willingness to teach other subjects such as elementary English and Math (in English and French). During school year, must be available weekdays from 2:30pm to 6:00/7:00pm. Willingness to work Saturdays from 10:00am to 1:00pm is an asset. Immediate availability and flexible schedule is an asset. To learn more about Richmond tutors, contact Oxford Learning® today! The Richmond Oxford Learning® provides proven tutoring programs to students in our community. Customizing tutoring programs to meet the needs of each individual student, our tutors will help your child improve his or her grades and confidence. Our tutors are dedicated to helping students reach their academic goals. The tutors at Oxford Learning® welcome students from Richmond and surrounding areas, including Steveston, Queensborough, Thompson.